Maureen Duffy has subtitled her latest novel a fable, and it is a device she uses to explore what the near future might hold for the United Kingdom should Scotland vote for independence in 2014. Through Terry and Paula, Londoners with connections to Scotland, she imagines what might happen to an ordinary couple as the political landscape of the country changes again and again. At the same time she juxtaposes the modern day break-up of Great Britain with the story of Colm (Columba), a sixth-century Irish Monk on a mission to convert the various tribes of Scotland and northern England to Christianity. Terry is a politician while Paula is an artist. They live in Camberwell, London, but also have a cottage near Dunoon in Scotland in Terry’s constituency. With independence Terry loses her Westminster seat but decides to stay on in Scotland and go back to lecturing. When American Christian fundamentalists start buying up television channels and influencing politicians, not only gay marriage but civil partnerships are outlawed. Terry finds her job disappearing when her college is no longer allowed to employ gay lecturers as Scotland lurches to the political right. Meanwhile Paula barely survives a splinter group’s bomb attack at Glasgow’s Museum of Modern Art and hurries back to the safety of London while Terry sees out her contract and quickly follows. Once more however they are faced with change as Wales and then Cornwall and Devon makes plans to secede from Britain. Duffy’s vision of the future of these islands is not one that either the yes or no camps would wish to promote. The schism with Scotland leads to another and another as England threatens to break apart, with the south being left behind economically and sliding into poverty and decay. The financial powerhouse that was the City of London is no more as the fickle money men decamp to Frankfurt or Geneva and even the boroughs of London start flexing their independence muscles. Power bases become smaller and more insular and former neighbours find themselves at odds with each other. 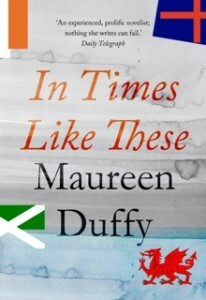 This novel is published by Duffy’s agent rather than a publishing house and unfortunately it shows. There are spelling and layout errors that irritate but what is most disappointing is the lack of a firm editorial hand. The characters of Terry and Paula are skeletal, mere devices for Duffy’s warnings about where nationalism can lead, and desperately need more meat on their bones. The story of Colm is not fully contrasted and compared with the modern day story which is a real shame as Duffy’s extensive knowledge is obvious and the tale of Christianity spreading across the land is fascinating. This novel could send a powerful message about the unintended consequences of perceived political utopias and how nationalism can provide fertile soil for extremists. However it would need another draft and a good editor to breathe life into it. As it stands it is a bold and cautionary warning to think before you leap into the unknown, but a little more work would make it an outstanding contemporary fable.